WoodmenLife is deeply committed to serving our country’s veterans and promoting patriotism. This Veteran’s Day, the 100th anniversary of Armistice Day, we would like to highlight some of the ways we honor that commitment. In 1947 WoodmenLife launched our patriotic program to show our gratitude to military veterans across the country. This program includes the donation of more than 3 million flags, service projects, focusing on patriotism in the second quarter, thanking our heroes and traveling flags. All these events and donations are our way of saying thank you to the women and men who have served our country. 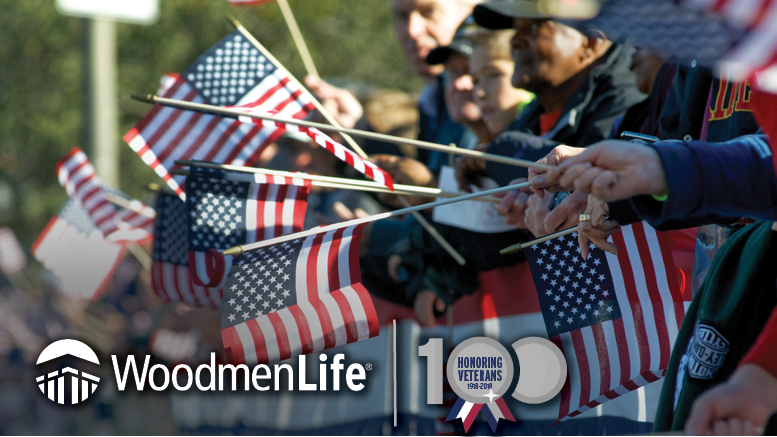 Since 1947 WoodmenLife has donated over 3 million American Flags to various organizations across the nation. These donations are made possible by members and employees that are dedicated to making a difference. Flags are an important part of promoting patriotism and honoring our veterans. Our associates work every day to support patriotism in their communities. Sometimes the donation hits close to home. On Sept. 26 WoodmenLife made a donation of 100 flags to the Trail of Honor in Fort Gibson, OK. The Trail of Honor is a line approximately 600 flags that follows the two mile path to Fort Gibson National Cemetery on major holidays. A WoodmenLife associate, Dustin Donnell, father is buried at the cemetery. “We were very honored to be able to make that donation to them,” said Billie Floyd, a WoodmenLife Community Outreach Manager. Since 2016 WoodmenLife chapters across the nation have held over 15,000 events to honor their local veterans. These events include: Memorial Day, Independence Day and Veteran’s Day. These events are ways that chapter members and employees can share their appreciation and gratitude for our countries incredible veterans. As we approach the 100 year anniversary of Armistice Day, we reflect on everything WoodmenLife has done in the past and look forward to everything we will do in the future. Our employees and members are dedicated to honoring our veterans, past, present and future.